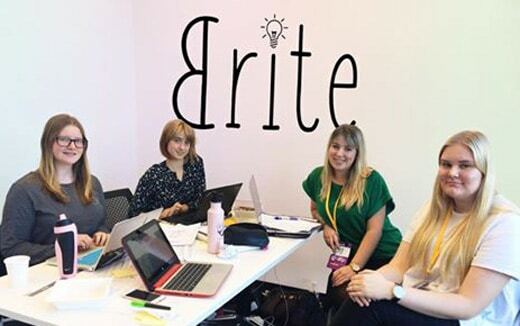 Former SPELD NZ student Madison Sykes has teamed up with her equally entrepreneurial classmates to set up a company called Brite and develop their first product. The iBrite is an LED device that projects a coloured light overlay onto a student’s page and work space. It has the same relaxing effect on the brain as the plastic coloured overlays used by many dyslexic students, allowing them to process written information more easily. At around $40, it’s also significantly cheaper than glasses with coloured lenses. Madison came up with the idea for iBrite as an eight-year-old. Local SPELD NZ teachers attended the official launch of an early iBrite prototype in Tauranga in August. Among them was Luci Carter who was impressed by the girls’ enthusiasm and product knowledge. The girls have recently completed 3D printing of the final prototype with sponsorship from 3Design. They are now testing it with a trial group, and working on a USB-chargeable version, and hope to enter the market with their product in 2018. In 2017 the Brite team was ecstatic to be named ‘Supreme Winner’ ahead of 504 other entrants at the Tauranga/Western Bay of Plenty Young Innovators Award. This incredible achievement saw them win a further $3000 prize and $10,000 worth of internships with businesses across the Bay of Plenty to move forward with their product development and branding. They have also been voted regional winners in the Young Enterprise Scheme, a nationwide competition for high school students and hope to become the national champions this month.